Heroes of Serbia - Memory Eternal: An American witnesses the crushing of Serbia in October of 1915, before the Great Retreat and resurrection of her victorious Army in World War One. An American witnesses the crushing of Serbia in October of 1915, before the Great Retreat and resurrection of her victorious Army in World War One. Aleksandra's Note: The following testimony comes from Fortier Jones, a young American from Texas who, in 1915, left his studies at Columbia University in New York to join the WWI Relief Effort in Serbia. 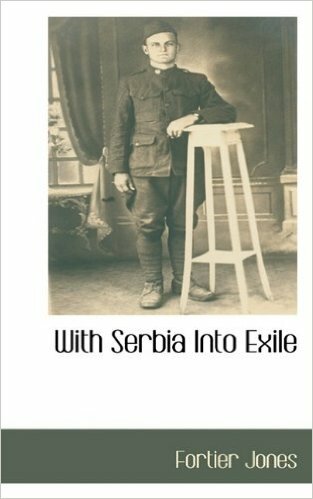 He arrived in the summer of 1915, in time to get to know the Serbian lands and the Serbian people during a relatively peaceful respite in the First World War, before the Central Powers, with Germany leading the assault, began pounding Belgrade in October of 1915. That was the beginning of the "modern" 20th century and the use of a new kind of devastating warfare from the sky. The assault on Serbia by the Central Powers in October of 1915 would lead to Serbia's Great Retreat, an epic event in the history of mankind that has few parallels. 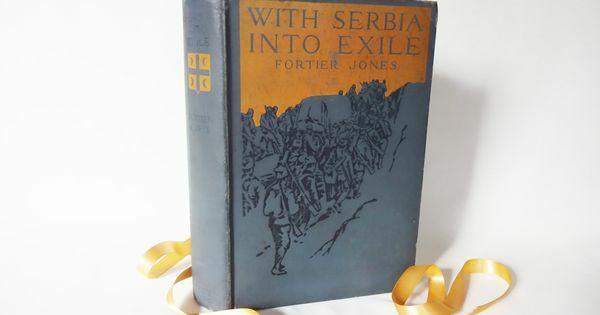 The memoir "With Serbia into Exile" by Fortier Jones was published in 1916, so his references to "last year" refer to 1915. I'm very grateful for such testimonies. They tell the true story in ways that the official versions of history often ignore. I have to thank a man on a Broadway express for the fact that at the close of September, 1915, I found myself in a remote valley of the Bosnian mountains. The preceding June (of 1915), this person, unknown to me, threw a day-old newspaper at my feet, and because it fell right side up, I became aware that men were wanted to do relief work in Serbia. In an hour I had become part of the expedition, in a week I had been “filled full” of small-pox, typhus, and typhoid vaccines and serums. Three weeks more found me at Gibraltar (British territory on the southern end of the Iberian peninsula at the entrance of the Mediterranean) enduring the searching, and not altogether amicable examination of a young British officer, and within a month I was happily rowing with hotel keepers in Saloniki, [same as “Salonica”, or “Thessaloniki”, the second-largest city in Greece and the capital of Macedonia] having just learned in the voyage across the Mediterranean that submarines were at work in that region. With a swiftness that left little time for consideration, the next few weeks passed in camp organization in Nish, in praying that our long-delayed automobiles would come, and in getting acquainted with a country about which I had found but little trustworthy information in America. Then, because an English woman, Miss Sybil Eden, with the intrepidity [resolution, bravery] and clear-sightedness which I later found characteristic of British women, decided that relief must be carried where, on account of great transportation difficulties, it had never been before, I spent six wonderful weeks among the magnificent mountains of Bosnia at the tiny village of Dobrun. On a certain day near the end of this sojourn my story of the great retreat properly begins. I sat chatting with a Serbian captain of engineers beside a mountain stream six miles behind the Drina River, where for almost a year two hostile armies had sat face to face, watching intently but fighting rarely. It was a beautiful day, typical of the Bosnian autumn. The sunshine was delightfully warm and drowsy; the pines along the rugged slopes above us showed dull green and restful, while the chestnut grove near which we sat showered hosts of saffron leaves into the clear stream at our feet. Overhead an almost purple sky was flecked with fluffy clouds that sailed lazily by. Peace filled the Dobrun valley, peace rested unnaturally, uncannily over the length and breadth of beautiful Serbia, and our talk had been of the preceding months of quiet, unbroken except for vague, disturbing rumors that were now taking more definite form and causing the captain grave concern. After a while the rain stopped, and we made good time on the perfectly level road that runs along the broad floor of the Morava valley, which many ages ago served as an easy highway for the Third Crusade. For miles on each side stretched smooth fields of Indian corn, small grains, and magnificent truck-gardens. Despite the primitive methods of agriculture, the Morava valley, which runs almost the length of Serbia, is one great garden plot, and is as beautiful and fertile as the valley of the Loire, in France. Last summer (1915), viewing this valley and its lesser counterparts along the Mlava, the Timok, and in the Stig country, the possibility of famine in such a rich land seemed too remote to consider. There were many workers in the fields, but all were women and children. It was they who gathered the ripened corn into the primitive ox-carts, reaped with scythes the waving wheat and rye, or plowed with wooden shares the rich, black loam. Women drove the farm stock along the highways, women filled the market-places in every village, and women for the most part waited upon us in the cafes. Almost the only men we saw were the lonely cheechas [older men] sparsely scattered along the railway to guard the bridges from the spies that lurked everywhere. We passed many prosperous villages in which, with the exception of the scarcity of men, life seemed to move on prosaically as in times of peace. We stopped and looked over the large sugar mills at Chupriya, now silent on account of the war and the scarcity of labor, and we passed some of Serbia’s best coal mines. Finally, at dusk, we came to Polanka through a narrow road where the mud was so bad that we had to be hauled out. From Polanka we had come next day for lunch at Semendria, and after a pleasant chat with the prefect and his son, a very likable young fellow with happy manners, we took the road to Belgrade. For fifteen or twenty kilometers the way ran on the bank of the Danube, there being barely room for a first-line trench between it and the river. Three hundred yards away the Austrian trenches were in plain sight across the river, though sometimes masked behind willow-trees. Leaving Semendria by way of the old fruit-market, where there were for sale at very low prices unlimited quantities of white and purple grapes, huge plums, large red apples, figs, pears, and fine peaches, we were at once exposed to the fire of the enemy’s cannon. Only there was no fire. The guns were there, the trenches, and the men, but unconcernedly we sailed along for an hour, flaunting our car in their faces, as it were, without calling forth as much as a rifle-shot. This was disappointing, for we had been told that they seldom let automobiles pass without taking a pot-shot or two, and for the first time since coming to Serbia we had seemed in a fair way for a war thrill. The Serbian trench was deserted except for sentries at great intervals, but higher up in the vineyards, on the other side of us, were more trenches and, beyond these, dug-outs where the soldiers lived. So that was what was hanging over the sunshiny peace of road that we so blithely sped along, while the two prosaic looking battle lines watched each other across the Danube – at peace. In the late dusk we came to the heights behind Belgrade, and looked down on the lights of the city strung along the Sava and the Danube, while just beyond the river the towers of Semlin gleamed in the waning light. London and Paris were dark every evening last summer , but Belgrade, always within range of the Austrian guns, was lit up as usual. With the exception of the section along the rivers that had been bombarded during the first invasion, and one hotel on the main street, which a shell had demolished, Belgrade might have been the capital of a nation at peace. The street cars were not running, but in such a little city no one missed them. We ran up a very rough street and placed the car in the yard of a private residence. Then M. Todolich took us over to his home which, when the capital was moved to Nish, he had had to lock up and leave like all the other government officials. One could see the pride of the home-loving Serb as he showed us over the charming little villa built around a palm-filled court where a small fountain played. Belgrade, being the only one of their cities which the Serbs have had the time and resources to make modern, I found them all very proud of it, with an almost personal affection for each of its urbane conveniences. With great enthusiasm monsieur showed us the mysteries of his very up-to-date lighting and heating apparatus. 'All the Serbian homes must be so some day when peace comes to us,’ he said earnestly. His was typical of many homes in Belgrade before October 6. In a fairly good hotel we spent the night…I was awake early next morning and, dressing hurriedly, went out into the brilliant August sunshine. The air was wonderfully clear and bracing. Newsboys cried along the streets, which many sweepers were busily at work cleaning. Nothing but peace in Belgrade! Searching out the automobile, I found a curious audience around it. There was Mitar, twelve years old, as straight as a young birch, with blue-black hair that fell in soft curls to his shoulders, and jetty eyes that peered with burning curiosity into every crevice of the motor, which he feared to touch. His beautiful body was tightly clothed in a dull-green jersey and white trousers that ended at the knees and left bare, sturdy legs very much bronzed. And there was his little brother Dushan, age seven, with still longer hair, but a dark brown, large hazel eyes, pug nose, and freckled face, furnished with a toothless grin, for he was at that exciting age when one loses a tooth almost every day. He stood behind his big brother and admonished him not to touch the car. In the seat, bravest of the lot, saucy, impudent, naughty, sat Milka, age five, dressed in a blue wisp of cloth that left tiny throat and arms and legs bare to the summer sun. She had hold of the wheel, and was kicking at the foot levers in wild delight, quite obviously driving that battered Ford at ten thousand miles a minute. But when suddenly she heard the step of the funny-looking American, one screech of laughter and fear, and Milka, like a flying-squirrel, was safe on the doorstep, demurely smiling. I tried to coax her back, but could not. Even when I lifted the hood, and Mitar danced about with excitement at the sight of the dirty engine thus disclosed, and Dushan stood with eyes of wonder, Milka remained smiling at me, posed for flight. As I worked about the car, a woman came out of the house toward me. I heard her light step upon the paved court and looked up. She was dark, not very tall, but dignified and wonderfully graceful, as all Serbian women are. Smiling pleasantly, she offered me a tray of the inevitable Slatko. This is a time-honored custom in Serbia, and is observed very generally, though, of course, as Western ideas come in, the old customs go. When a guest comes to a Serbian home, the hostess—always the hostess in person—brings in a tray with preserved fruits. On it are spoons, and the order for each guest to help himself to a spoonful of slatko, place the spoon in a water-filled receptacle, and take a glass of water. Then Turkish coffee follows, and a liqueur, usually plum brandy, from the home-made store which every Serbian home keeps. It is a sort of good-fellowship pledge and charming in its simplicity. Now the lady of the house was observing the honored rights of the slatko to this foreigner who late the evening before had deposited a very muddy automobile in her courtyard. There was till a good half hour before M. Todolich would be ready, so I determined to take the children riding, my ulterior motive being to win over Milka. They had never been in an automobile before. We rolled the car out of the court, and started the engine. No sooner had the automobile appeared in the street than the neighborhood became alive with children, all running toward us, the traces of half-finished breakfasts showing on many of their faces. I piled them all in, on top of each other…Milka had deigned to come to the sidewalk, where I pretended not to notice her, but took my seat at the wheel. If you had never, never had a ride in an automobile, and would like to very, very much, and if your were to see one just about to go away with everyone else in it and you left behind, what would you do? Milka did not set up a yell or smash anything. No, at five she knew a better way than that. Calmly, but very quickly, before the automobile could possibly get away, she stepped upon the running-board, pushed two youngsters out of her way, bobbed up between me and the wheel, climbed upon my knee, and gave me, quite as if it had been for love alone, a resounding kiss on the cheek. I am sure she might have had a thousand Fords if she could have got in one such coup with the great Detroit manufacturer. So on that cloudless August morning we had a “joy ride” through the streets of Belgrade, and the noise we made could, I know, be heard in the enemy-lines. This was only a few short weeks before the sixth of October, 1915. Of course, war is war, but let us get a picture. Suppose on a perfect day in Indian summer you sat in that tiny, flower-filled court with the hospitable mother, Mitar, the handsome, Dushan, the cautious, and Milka, the coquettish. As you romp with the children, you hear distantly a dull clap of thunder, just as if a summer shower were brewing. A second, a third clap, and you walk out to the entrance to scan the sky. It is deep blue and cloudless, but away over the northern part of the city, while you look, as if by magic, beautiful, shiny white cloudlets appear far up in the crystal sky, tiny, soft, fluffy things that look like a baby’s powder-puff, and every time one appears a dull bit of thunder comes to you. For twelve months off and on you have seen this sight. You think of it as a periodic reminder that your nation and the one across the way are at war. You know that heretofore those powder-puffs have been directed at your own guns on the hills behind the city and at the entrenchments down by the river. But there are many things you do not know. You do not know, for instance, that Mackensen is just across the river now with a great Teutonic army outnumbering your own forces five or six to one. You do not know that for weeks the Austrian railways have been piling up mountains of potential powder-puffs behind Semlin, and bringing thousands of ponderous machines designed to throw said puffs not only at the forts and trenches, but at your flower-filled court and its counterparts throughout the city. You do not know that aeroplanes are parked by fifties beyond Semlin, and loaded to capacity with puffs that drop a long, long way and blossom in fire and death wherever they strike. You do not know that from a busy group of men in Berlin an order has gone out to take your city and your nation at any cost, and if you knew these things, it would now be too late. For as you look, in a few brief moments, the thunderstorm rolls up and covers the city, such a thunderstorm as nature, with all her vaunted strength, has never dared to manufacture. Mitar and Dushan and Milka stop their play. Worried, the woman comes out and stands with you. You say the firing is uncommonly heavy today, but it will mean nothing, and as you say this, you notice the powder puffs on the slopes of the hills far short of the forts and over the town itself. High above you to of them suddenly appear, and the storm begins in your region, in the street in front of you, on the homes of your neighbors. With increasing rapidity the rain falls now, five to the minute, ten, fifteen, twenty, twenty-five every sixty seconds, and every drop is from fifty pounds to a quarter of a ton of whirling steel, and in the hollow heart of each are new and strange explosives that, when they strike, shake the windows out of your house. Looking toward Semlin, you see the aeroplanes rising in fleets. Some are already over the city, directing the fire of the guns across the river, and others are dropping explosive bombs, incendiary bombs, and darts. In a dozen places already the city is blazing terribly. A thin, shrill, distant sound comes to you and the waiting woman, almost inaudible at first, but quivering like a high violin note. It rises swiftly in a crescendo, and you hear it now tearing down the street on your left, a deafening roar that yet is sharp, snarling, wailing. Two hundred yards away a three story residence is lifted into the air, where it trembles like jelly, and drops, a heap of debris, into the street. Your friend lives there. His wife, his children, are there, or were, until that huge shell came. Milka, Dushan, and Mitar have come in time to see their playmates’ home blown to atoms. Without waiting for anything, you and the quiet, frightened woman seize the children and start out of the city. As you come to the road that winds tortuously to the hills behind the town, you see that it is black with thousands and thousands of men and women dragging along screaming Mitars and Dushans and Milkas. Hovering above this road, which winds interminably on the exposed hillside before it reaches the sheltering crest, flit enemy aeroplanes, and on the dark stream below they are dropping bombs. There is no other road. You know you must pass along beneath those aeroplanes. You look at the woman and the children, and wonder who will pay the price. Oh, for a conveyance now! If only the American were here with his automobile, how greatly would he increase the children’s chances! Carriages are passing, but you have no carriage. Railway-trains are still trying to leave the city, but there is literally no room to hang on the trains, and the line is exposed to heavy fire. Only slowly can you go with the children down the street already clogged with debris. Now in front you see a friend with his family, the mother and four children. They are in a coupe, drawn by good horses. How fortunate! The children recognize one another. Milka shouts a greeting. She is frightened, but of course does not realize the danger. Even as she is answered by her playmate in the carriage, all of you are stunned by a terrible blast, and there is no family or carriage or horses any more. There is scarcely any trace of them. The fierce hunger of a ten-inch shell sent to wreck great forts is scarcely appeased by one little family, and, to end its fury, blows a crater many feet across in the street beyond. Along with you, Mitar has realized what is going on, and not the least of the trouble that overwhelms you is to see the knowledge of years drop in a minute on his childish face when those comrades are murdered before his eyes. If he gets out of this inferno and lives a hundred years, he will never shake off that moment. The shell has blown a crater in his soul, and because he is a Serb, that crater will smoke and smolder and blaze until the Southern Slav is free from all which unloosed that shell or until he himself is blown beyond the sway even of Teutonic arms. He grasps his mother’s hand and drags her on. Two loyal subjects of the Kaiser were dexterously dropping bombs on Kragujevats one morning. They pitched some at the arsenal, which they missed, and some at the English women’s hospital camp, which they hit, one bomb completely destroying all the unit’s store of jam. A nurse was a few feet away, unaware that anything was threatening until orange marmalade showered her. Then she and all her colleagues went out into the open to watch the brave Germans. They were sailing about nicely enough until a stray piece of shrapnel hit their gas tank. Then the eagle became a meteor, which by the time it lighted in the middle of the camp, was burned out. The two obedient subjects of the German emperor were incoherent bits of black toast, and the women came and picked souvenirs off the aeroplane. They showed them to me. So you passed with the mother and children by these patches of horror that mark the trail of the newest warfare. Or perhaps you lingered in the city until the second evening, when no one any longer dared to linger even in the scattered sheltered spots. Perhaps with the mother, Mitar, Dushan, and Milka, you came out at dusk of the second day, when the remnant of the population was leaving, when the enemy had effected their crossing, and hand-to-hand combat raged down by the river, when the guns were being dragged away to new positions, and the troops were falling hurriedly back. If you did, you left in a final spurt of the bombardment, and on the crest of the hills behind Belgrade you stopped to look back for the last time on that city. The city that in future years you may come back to will have nothing in common with the one you are leaving except location. Major Elliot, of the British marines, stopped at this time to look back. A few days later he told me what he saw. There was a dump-heap, an ash pile, several miles in extent, lying along the Sava and the Danube. In hundreds of spots great beds of live coals glowed, in hundreds of others roaring flames leaped high into the sky, and over the remaining dark spaces of the heap, where as yet no conflagration raged, aeroplanes, sailing about, were dropping bombs that fell and burst in wide sprays of liquid fire, sprinkling the city with terrible beauty. Thirty or forty to the minute huge shells were bursting in the town. You may get away with the family, or you may not. You and the mother may be killed, and Mitar left to lead the younger ones. All three may be blown to pieces, and only you two left with the memory of it. More than seven thousand just like you and yours, hundreds of Mitars with bright dreams and curling hairs, hundreds of little, freckled pug-nosed Dushans, hundreds of dainty, laughing Milkas, reddened the rough paving stones of Belgrade or smoldered beneath the glowing ruins of homes such as M. Todolich had proudly shown me. Another trip which I made from Nish to Zajechar along the valley of the Timok further revealed to me the vast, potential resources of Serbia. We saw little armies on this trip, because we were along the Bulgarian frontier, and it was then too early for Serbia to have heavy forces massed there. Everywhere the peasants pointed to the eastward and told us: ‘There lies the Bulgarian frontier. There it is, just on top of that mountain. From here it is only half an hour’s walk.’ They spoke of it as if it were a thing alive, which was being held back by them by main strength and awkwardness, and they spoke of it with awe. How well, in that peaceful summer, they realized what a move on the Bulgarian frontier would mean to them. And this for me was the bell that rang up the curtain on what is, without doubt, one of the greatest tragedies our century will see. It came on a nation almost as much at peace as Belgium was, a country much larger than Belgium, with no good roads, with no France, no England to offer refuge, nothing but wild mountains devoid of food. It came not in the days of summer, when shelter is a habit and not a necessity, but at the beginning of the savage Balkan winter, when a roof very frequently means life, and it lasted not three or four weeks, but ten.